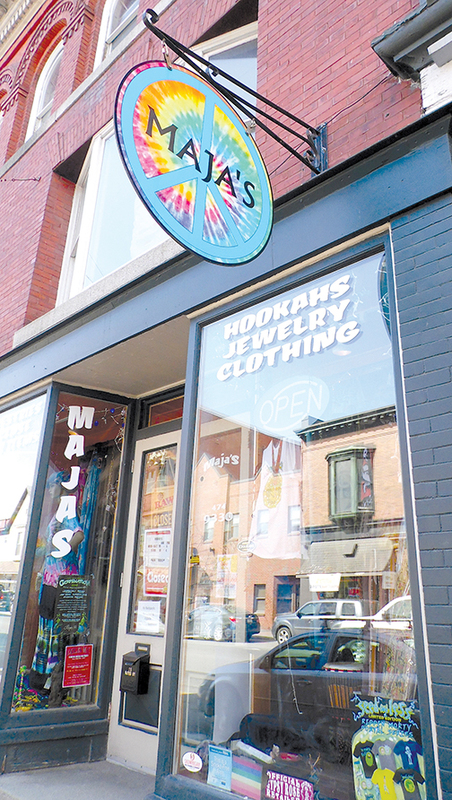 Maja’s has a tie-dye sign hanging over 75 Water Street, Skowhegan with a peace sign that takes passersby back to the 60s and 70s. The desire for peace never goes out of style. Trailing Libby into Maja’s as she was opening at 10 a.m. one morning, she was spotted puttering behind the counter setting up for the day. A gray-haired grandmother, she raised four daughters and worked 20 years as a certified nurse’s aide until she hurt her back. “I could never walk by someone who needed help,” Libby said. Someone always needs to be lifted or helped in and out of bed and it catches up after all the years, she said. Her shop is a cornucopia of visual pleasure. Libby has fashion items including tie-dyed T-shirts, incense, Hookahs, bongs, pipes and papers, inspirational cards, henna tattoos, hair tattoos and glow-in-the-dark body paint. She also carries salt lamps, Buddha statues, books, mortars and pestles, wind horses, buttons, posters, gem stones and jewelry. Customers also can find crystals, sun catchers, prisms, bags, Tarot decks and fleecy blankets— everywhere in the shop there is something colorful and interesting. Libby started her shop in the back part of a tattoo parlor that once occupied the store front she now runs on the downtown loop. She’s been there seven years and considers her store a “hippy shop,” she said when asked whether she thought of it as a head shop. She calls it peace and love hanging on in a world gone mad. So what happened to the tattoo parlor? “I’d end up dealing with his customers when the tattooist didn’t show up,” Libby said. Libby finally took over the space. One of Libby’s daughters is training to be an herbalist and practices Reiki and other holistic health care. 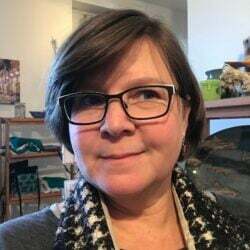 Her partner, Carmen Walsh, helps in the shop sometimes, but also works as a chef at Cedar Ridge Center, Skowhegan, a skilled nursing home facility. When not at the shop, Libby said she putters in her garden, which is mostly about flowers and a concrete deer that was her father’s, as well as fairies, puppies and bird feeders. Meanwhile, she tends to her two cats and a shih tzu dog. She admits she has to hire someone to do the heavy yard work and raking. Conversation was diverse—about bad backs and aging, about pollution and environmental degradation, about loving friends, family and the town. “Whatever is good for your soul … do that,” touts the message from one of the posters in the shop, where Libby has created a warm, inviting, positive place —whether you are an aging hippy or not.